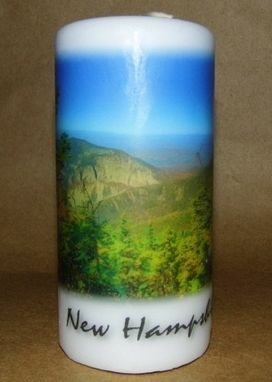 Enjoy the beautiful scenic scenes of New Hampshire on your own keepsake candle . You just have to see them to appreciate their beauty. These candles will become keepsakes within your family. Perfect gift for ANY Occasion. Never leave a burning Photo Candle unattended. Never burn a Photo Candle for more than 3-4 hours at a time. Never burn the last 1/2" of a Photo Candle. Keep Photo Candles away from drafts, vents and flammable objects. Keep Photo Candles out of reach of children and pets. Keep matches and other debris out of your Photo Candles. Always burn Photo Candles on a protected heat-resistant surface. Always keep your Photo Candle wick centered and trimmed to 1/4". Extinguish all Photo Candles carefully. Keep Photo Candles out of direct sunlight to prevent fading. When lighting your personalized, custom Photo Candles for the first time, let the wax pool reach no less than 1/4" from the Photo Candle's edge, extinguish the flame and allow the Photo Candle to harden before relighting. This will prevent leaking by building a strong shell around the Photo Candle's perimeter. Naturally New Hampshire Photography & Gifts can not be held liable for damage or injuries from misuse of a personalized, custom Photo Candle. Burning instructions are included with each and every candle.